Mr. Turtle and I had our sixth wedding anniversary yesterday. It was pretty low key. We came close to forgetting about it: mainly because we had been on vacation the week before and had somewhat lost track of days, and then the day before we had a very long, late road trip to return home. But, right at midnight, I saw "July 17" on my phone and went: Oh yeah! So the next morning we started our celebrations by going out for Dutch pancakes as a family. Later, we took AJ to my FIL's for the evening and then went for dinner together at the historical park where we got married. A lot of our daily activity consists of chores, errands, meal prep, playing with AJ, chasing AJ around the house, cuddling and caring for AJ, talking about AJ....well, you get the idea. When the aforementioned VIP is finally asleep, we often slump in front of computers or phones for a little bit of solitude. Other times we'll drink tea, eat dessert and watch something silly on TV, which is nice, but I tend to fall asleep after about half an hour. When the two of us are alone together it's good to be reminded that we can still find lots to talk about and see our questions and answers and quandaries reflected in each other. Our two shared meals started a discussion that ranged over changing family roles to current events in the news and back to family roles and values. If I was to summarize, I'd say we both agree that the best way to make a difference in the world is to have a strong relationship together and raise our child with love, consistency, and transparency. But, there was a lot of ground covered to reach that conclusion, if you want to call it a conclusion! One of the themes that came up was what are the most important things we pass on to children. I think we were talking about poverty and class divisions. My question to Mr. Turtle was: other than material things, what of value do parents give their children? If you don't have a lot of money or material wealth (or even if you do), what can you give your children that will actually make a difference in their lives? One answer was the awareness that every person's inner life is interesting and valuable. When I think back on my life, I have always found my thoughts, feelings, and perceptions valid and interesting. I may or may not be enjoying what is going on in my life at the time, but I can always process it, reflect on it, and use it for a creative purpose. The creative act might be a piece of art, an essay for school, a job search, a discussion, or no more than a journal entry or a mad dance in the dark to my favourite song of the time, but it is my voice in the world, and nothing is ever more important. Perhaps this is part of the reason I have kept all my writing and all my school projects from high school on. I don't look at them and ooh and aah in admiration for myself (hahahahahaha) but I know they are there and that they are part of my individuality. Did my parents teach me this? Yes, I think in part. My mom always encouraged me to take great care of my work: she collected it, helped me create little books, asked me when I was writing the next poem/story/whatever. That taught me it had value. Mr. Turtle and I also discussed movie adaptations from books, and how they are different. For me at least, a large part of why movie adaptations are less satisfying than books is because inner conflicts and voices don't transfer well to the screen. A good writer can explore his or her characters' thoughts and value conflicts for pages and pages, and it's riveting reading. But that's hard to do on screen, so inner conflicts are externalized to conflicts between characters. I always find that disappointing, or rather missing the point. Some people like to act out all their conflicts with/on other people, I guess, but for those of us who tend to carry them around and reflect on them, that can seem like too much drama already. It also implies that the relationships/conflicts we have with other people or with "society" or "environment" are more important than our inner lives, and I don't agree. Obviously those external influences and relationships are important, but everything we do starts with some thought or impulse we have. And our thoughts and impulses come from our inner life and how we process the world. It is important to listen to that and understand what is happening, especially if there is any conflict or distress (and there usually is!). 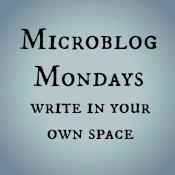 This is, of course, a big reason I enjoy the blog world: Blogs can make the inside voices audible (so to speak). 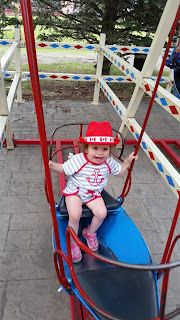 We went back to the The Fertility Clinic today for the first time since January of 2014. Last time we were there was for a couple of emotional meetings, one with Dr. Cotter, one with the counsellor, discussing our cancelled IVF. About a month later I made a phone call to the The Fertility Clinic, saying I was - surprise! - pregnant and asking if they could be of further assistance. They said no: since they didn't actually get me pregnant, I was under the care of my family doctor. And that was that. I wasn't looking forward to going back to the clinic. We don't have very happy associations with the place. On the other hand, when I think about possible ways to grow our family, the clinic still might be able to offer some options. A meeting is the place to start, and putting it off wasn't accomplishing anything. So, today was the day. Mr. Turtle offered some optimism as we approached the familiar waiting room: "Last time we were here we were wondering if we would ever have a baby." And now we do, was the rejoinder neither of us needed to say aloud. He's right, of course. The emotions are a lot different this time around. The first time we went to The Fertility Clinic, I saw (or wanted to see) the doctors as scientific wizards who would do for us what our bodies couldn't. Some of that feeling remains, perhaps, but I have more appreciation now of the randomness of life and how our human knowledge and awareness always falls short, no matter how expert. I was also anxious about seeing Dr. Cotter again, mainly because of her blunt way with words and because I was worried she might push us to do donor egg IVF right away. Intellectually I know this is ridiculous because it's our family and my body and nobody can make me, or us, do things we don't want to do. If I dig deeper though I think my true fear was that I would be treated like a case number, not an individual. While I understand that the clinic is a business and they offer services for money, I also feel some vulnerability because I am approaching the people there for direction and counsel on a very sensitive matter. I want to know that they are acknowledging and responding to the uniqueness of our situation, not just pushing us toward whatever process they think is most likely to make a baby. Having said all that, I am happy with how the meeting went, probably because it went exactly the way I wanted and expected it to. Dr. Cotter was fully in character. She summed up my past fertility assessment with "You were young and in good health, but your ovaries were acting like those of a 45 year old woman." On our failed cycle: "even the strongest drugs could do nothing for you." But then she added: "It's good to know that spontaneous pregnancy can still happen, and there are obviously some young eggs left in there." After going over some basic details of my past pregnancy, I mentioned that while donor egg IVF is on the table, we would like to look at possibilities for increasing our chances with unassisted conception first. Since I took DHEA and COQ10 supplements before AJ's conception, I thought we could try that again. Dr. Cotter agreed. (DHEA requires a prescription in Canada.). She said to give the DHEA about six months to be effective, which fits with the timeline I had in mind. I also mentioned one of my theories, which is that the suppressant used for Flare IVF might have actually helped my cycle by stopping my body from ovulating too early. My ovaries seem to want to jump the starting gun which leads to early ovulation, short cycles and probably poor quality eggs. 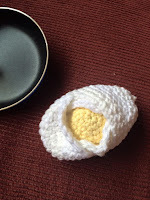 Stopping that process might have allowed an egg to mature properly. Dr. Cotter did not comment on this specifically, but mentioned that the DHEA should help to regulate my cycles. She also said we could possibly try "something" before moving to donor egg IVF. We did not discuss what that something might be, but I was glad to hear that she is at least considering other treatments that might work for us. While I don't expect her (or us) to commit to anything right now, it's part of being heard and considered as an individual. In the meantime there are tests to do (of course!). -Day 2 blood work (Estradiol, FSH, LH, TSH, prolactin: some of those abbreviations I will have to look up, since my short term memory has expelled them). In addition, they will look at antimullerian hormone, which according to Dr. Cotter is the next big thing in fertility testing and in a couple of years will replace FSH testing and antral follicle counts. -Pelvic ultrasound, with antral follicle count. I opted to forgo the uterine x-ray for now as it can interfere with a pregnancy, but if we do decide to do donor egg I will have to go for that one. The egg is ready to fry! 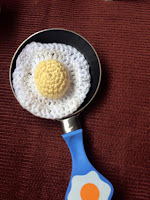 A note on crocheted eggs: Since this post has been getting a bit of attention, including Mel's 603rd Friday Blog roundup (thank you Mel!) 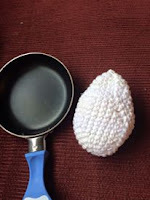 I will mention for any crocheters that I did write down the instructions for the egg. I will have to search around the house to round up the various sticky notes that I scrawled it on, but in theory I can share the pattern with anyone who is interested. Leave me a comment or email torthuil(at)gmail.com if interested.